If you have staff on the road as part of their job, mileage tracking is probably a major source of administrative strain. Learn more about how to more effectively track mileage with these mileage tracking best practices so that you can most efficiently track and reimburse for mileage. First, you’ll need to make sure that the mileage is actually reimbursable. For most companies, trips from the employee’s home to the work location are not reimbursable because that constitutes the employee’s regular work travel. However, if they are traveling to a location outside of the office or if they’re traveling outside of normal work hours, that probably counts. Using addresses inputted by the user, an automated mileage tracking system can determine whether the miles are reimbursable. In general, if the home address is used, the system will put up a notification saying that this is not a reimbursable trip. Be more accurate with your calculations. Sometimes, whether on accident or on purpose, employees might round up when calculating mileage. The result is that your company can over-reimburse the employee for that trip. This might not sound like a lot if the employee is rounding up from the nearest half mile. However, if an they make this trip over and over for a year, that can add up. Think about how a few trips a week can add up to tens or hundreds of extra miles reimbursed that weren’t actually driven. Instead, expense report software that comes with automated mileage tracking can be the solution. 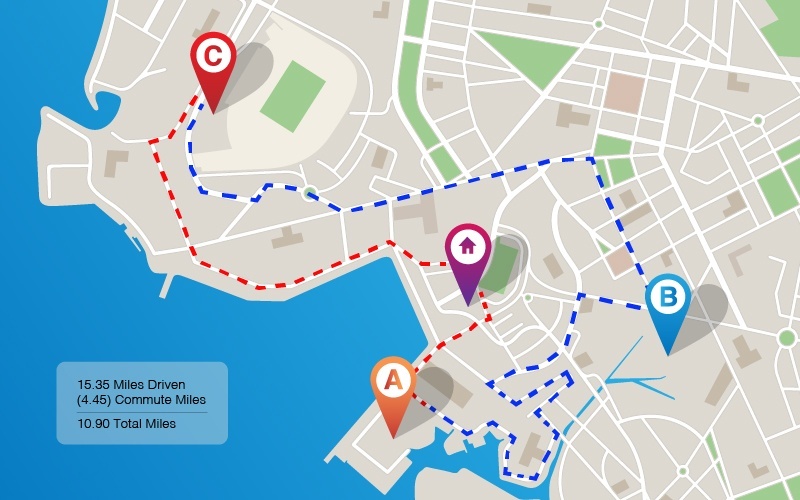 Using a Google Maps integration allows employees to easily enter addresses for Start/Stop to track the most accurate mileage, down to a tenth of a mile. This can save your organization hundreds or thousands of dollars per employee, preventing over-reimbursement in the future. Make sure the trip is actually for business. Employees can get frustrated sometimes when their mileage is not approved for reimbursement due to a lack of information about the trip. Make sure to train employees on how important it is to clarify in writing, even if it seems obvious, how the trip is related to the job. Giving employees the power to use automated software can ensure that mileage meets policy requirements. Then, the system can automatically check against the policies that you’ve put into the system and deny any submission that does not meet company rules. Simplify mileage tracking with a mobile app. Employees need to be trained on the importance of managing their mileage logs, but they might be hesitant to do so when this task involves a lot of work. This is especially true if they have to track by hand. A mobile application makes it easier to tackle this complex task, so that employees are more likely to put in the effort to do it while the information is still fresh in their minds. The app needs to be intuitive enough that employees don’t need to be trained and simple enough to begin using it for their daily work. Another requirement is that the mileage tracking system needs to integrate tightly with your existing expense reporting processes. This means that an all-in-one mileage tracking and expense reporting solution will work well. Approvers, employees, and upper management don’t have to dread tracking and managing mileage. Automated mileage tracking streamlines your processes and prevents over-reimbursement. Learn more about how DATABASICS Time & Expense™ can help your organization.